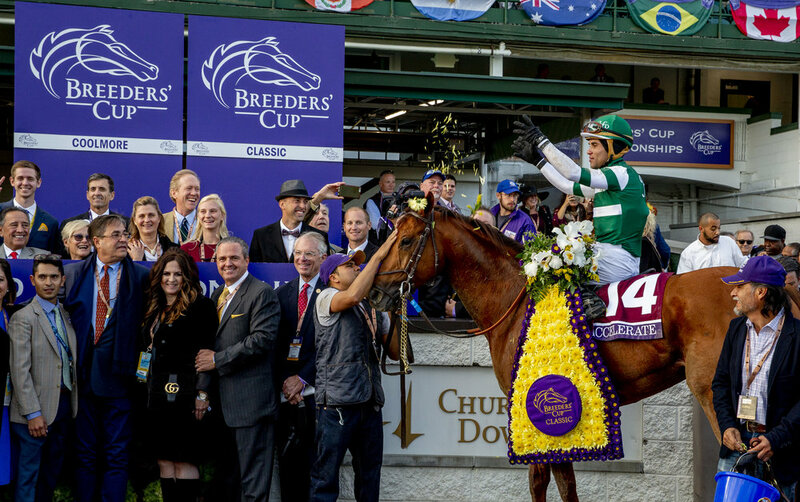 When Accelerate and Joel Rosario won the 2018 Breeders’ Cup Classic, they did more than give trainer John Sadler and the Hronis brothers, Kosta and Pete, their first victory in a Breeders’ Cup race. They took Sadler and Hronis Racing, and Rosario, too, full circle. Sadler couldn’t have cared less and welcomed Hronis Racing into his stable, where they had considerable success with Lady of Shamrock, Iotapa, the incredible mare Stellar Wind and Hard Aces. The brothers, whose parents began Hronis, Inc., specialize in growing, packing and shipping premium citrus in Delano, California where they were born and raised. They were the leading owners at Santa Anita in 2012 and 2014 and at Del Mar in 2012, remarkable early success for new owners. But they’d never won a Breeders’ Cup race before the 2018 Classic, losing their first 13 races, including Catalina Cruiser’s disappointing sixth as the 4-5 favorite in the 2018 Breeders’ Cup Dirt Mile. Sadler topped that oh-fer, going zero-for-44, including three losses in races before the Classic—one of them when Catapult finished second by a half-length to Expert Eye in the 2018 Breeders’ Cup Mile. That didn’t prevent the owners and trainer from feeling confident with Accelerate and Rosario, who went off a deserving favorite in the Classic. “Joel Rosario rode our very first horse in our very first race in February of 2010 on Sleep Ride, a little horse that John claimed for us; and to turn all the way around and have Joel win the Breeders’ Cup Classic today, it’s a special day and we’re very happy for Joel,” Kosta said after the race.